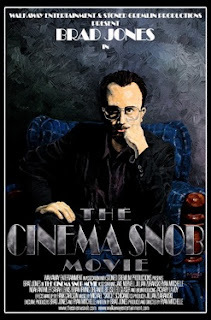 UMUSTBEBORED: THE CINEMA SNOB MOVIE: A film for people who love film. THE CINEMA SNOB MOVIE: A film for people who love film. If you don't know who Brad Jones is then I suggest heading over to his website Thecinemasnob.com. He plays a character called the Cinema Snob who watches some of the most bizarre, freakish, obscure films ever made and then reviews them for us. As the Snob, Brad has no problem lambasting these films and yet still loves their existence by collecting as many of them as he can. What I like about his reviews is that not only is he funny but he is extremely insightful with his critiques. You learn a lot especially if you are into making movies on what not to do. If you were ever curious about a movie but didn't want shell out the cash for it then I suggest watching the Cinema Snob review it. You get a good sense of how craptacular the movie is and you get to see all the good moments without losing any money you stole from your Nana's purse. What Brad is doing here is taking his love for movies a step farther by making his own comedic exploitation movie. Oh, how the tables have turned. Now it is his work under the microscope. Did he make a good movie worthy of your attention? Yes. Yes, he did. THE CINEMA SNOB MOVIE starts off about two no budget film makers trying to get an exploitation movie called BLACK ANGUS made. Brad Jones plays Craig Golightly a long haired fake beard wearing film maker trying to convince the head of the film commission, Dan Phillips to give him permits to film his movie. Unable to win Dan's endorsement Craig joins his film club for pretentious film critics by becoming the Cinema Snob. He cuts his hair, and puts on the glasses and signature suit fooling the critics and wowing everyone in the film club by showing them SALO. I won't even explain SALO. Just don't watch it. Now you are going to, aren't you? While he is inside the club he meets the beautiful Nancy (played by Brad's real life wife Jillian Zurawski) who is married to Dan Phillips. The two hit it off but things get complicated between them when the film club members start dying off one by one in giallo style and Nancy becomes the prime suspect. The strength of THE CINEMA SNOB MOVIE is the writing. The look of the film is rather bland with not too many interesting or creative film angles or movement. Sometimes the audio levels fluctuate between shots in the same scene which can be a little distracting. It is a low budget movie after all. There are going to be things you need to forgive. Pay attention to the dialogue though. There are so many funny lines that you will miss some from laughing so hard. At least I did. I like humor that doesn't need to explain itself. Either you get it or you don't. There are several references to obscure movies. You may not get them at all. Doesn't that just make you want to go out and learn more? Most of what he references is in his reviews on his website though. Maybe this is one of those movies where you really need to be a fan of the Cinema Snob to like. I figure though if you are into cheesy exploitation movies you will find a movie like this a bit refreshing showing some love to them. Brad carries the entire film playing the Snob perfectly and giving a strong performance especially during one scene where he is monologuing to the killer about loving what you do despite being hated on by the film critics. There are a couple of really great scenes like this usually involving him making fun of critics who over analyze films to the point of absurdity. Not everything is a metaphor for the Holocaust. Noah Antwiller (Spoony from the SpoonyExperiment.com) gives an energetic and hilarious performance as the town's richest man who is crazy enough to fund BLACK ANGUS. Spoony does reviews of all kinds of nerd-o culture stuff like computer games and movies and such. I highly recommend watching his stuff as well.